By using natural pest management practices (integrated pest management or IPM), we support the good bugs who help get rid of the bad bugs. 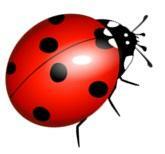 Click here for a list of beneficial insects for the garden. One of the key problems with using chemical pesticides and herbicides in the garden is that they don’t differentiate between the good and the bad bugs and kill them all. This actually makes the bad bug problems worse because we kill off Mother Nature’s helpers. We have to remember that, before the good bugs will come, there have to be enough bad bugs to make it worth their while to make the trip to our garden. We often react at the first sighting of aphids in our garden rather than waiting a few days for the ladybeetles and other beneficial predators to find them. Patience will pay big benefits to us and our gardens when it comes to pest management. If we wait for the beneficial insects to react to our infestation, they will deal with it quickly and painlessly for us! In addition, if we include ‘habitat plants’ – those plants that provide food and habitat for beneficial insects – in our gardens, we will be more likely to have those beneficials there when the pests arrive. Use these links to find a list of plants that support beneficial insects: Building a Habitat Garden - Part II and Habit of a Habitat. Remember to plant in masses of 3 to 5 plants rather just one or two; this will provide enough food to support the numbers of good bugs needed to keep your garden healthy.